OSHA: One of our exit doors locks from the outside. What are the OSHA guidelines for exit doors that are locked inside? According to standard 1910.36(d), An exit door must be unlocked. Employees must be able to open an exit route door from the inside at all times without keys, tools, or special knowledge. 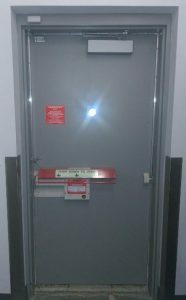 A device such as a panic bar that locks only from the outside is permitted on exit discharge doors. HIPAA: Our office received a HIPAA complaint. What is the first thing we should do? Taking all complaints seriously and responding in a timely fashion is key. 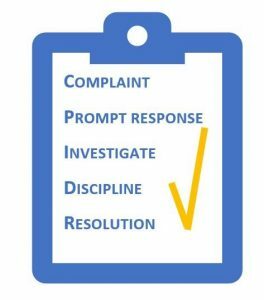 Once a written complaint has been filed, your Privacy Officer should review the complaint and complete an investigation. Appropriate disciplinary actions will be taken if indicated based upon findings of the investigation. The resolution will be provided to the patient. It is critical to avoid any action that may be construed as retaliation against the person for submitting the complaint. In the past five years, several employees and patients have submitted HIPAA complaints to the Office of Civil Rights (OCR) which resulted in operational changes and fines. Before an issue escalates, be sure to address and resolve all complaints locally. February 2017 – Heidi is such a great asset ! She is thorough in all she does but still makes it fun and interesting. She has an answer for every question and is always one step ahead. She is knowledgeable in what to look out for in the future to make sure we can do what needs to be done before it is “required”. She’s the best!